This may be oversimplifying things, but IT had better have an answer ready when it comes from executive management. It’s a highly loaded question, since it implies that you should have AI – whatever “AI” actually means. For those in IT circles, AI has a lot to do with technology, but your management team is likely thinking more about business outcomes and how to keep pace with competitors. Worse yet, they may see AI as the latest shiny ball they must have, and that it will somehow make the business more successful. Finally, IT must diplomatically determine if the question is accusative – isn’t IT supposed be on top of these things? – or just a big picture conversation-starter about what’s best for the business. These will likely be familiar scenarios for our readers, and I want to build on some takeaways from a presentation at a recent SCTC regional event. The speaker was Gord Sexton from Genesys, and he provided useful guidance, primarily for consultants to get their clients thinking the right way about AI. There’s more to consider, but here are two key approaches for getting executive buy-in for AI initiatives. If the question about having AI isn’t coming from a place of purpose, IT’s answer may be more about appeasing management and treating it as another technology checkbox item like cloud or mobility. After all, if management isn’t going to take a hands-on interest in AI, how will they know if you’re doing a lot or a little with it? This reflects a tactical approach to IT, and it will stay on their radar until the next hot trend comes around. What IT really needs to do is take a strategic approach, and that means providing clear use cases that management will relate to. CX – customer experience – is a great use case for AI, especially since it’s now become a strategic priority for many businesses. While the selling points of AI for IT will tend to be technology-based, I wholly agree with Gord’s guidance for getting executive management onboard. His view is that the best way to talk about AI with them is to not talk about AI. Using CX as the example, it’s better instead to talk about the journey that end customers are on. The better your contact center can understand that journey, the better the CX, and from there, the needle move on metrics that management really cares about. Those outcomes are what makes AI strategic, so that’s what the conversation needs to be about. They’re not really interested in how AI works – that’s IT’s domain – so just focus on what’s important to them. This sounds easy and very logical, but in practice, it’s likely more the exception than the rule – otherwise Gord wouldn’t be talking about it. Taking this a step further, to really make AI strategic, you need to frame those use cases around real pain points and get to root causes. When the CEO asks about having AI, Gord talked about asking “why” in return – not once, but three times to get beyond the superficial and go from effect to cause. Too often, executives will only think about AI in terms of automation and cost savings, and IT will think only about what’s best for its domain, which really only addresses operations. For the CX use case, that would mean using AI only to make the contact center more streamlined and for agents to perform more efficiently. That’s certainly a valid use case for IT, but it’s tactical, and is of limited interest to executives. If you don’t keep asking “why,” the vision for AI doesn’t go any further, and won’t address what’s really important. When executives ask IT “why don’t we have AI?”, you need to “go deeper” and show how AI impacts the customer journey, and not just contact center operations. In this regard, the operational benefits become additive to the CX improvements that management really wants to see. When hearing all of this, an old Seinfeld episode came to mind right away that I think sums this up really well. I’ve been waiting a long time to use this when writing about CX, and am sure you’ll remember it. There’s a big difference between these two things, and that’s exactly what we’re talking about here. The old-school, legacy model of customer service would focus on the operational aspect of CX – taking the reservation. That’s very tactical, since it’s just one step along the entire customer journey that ultimately defines CX. 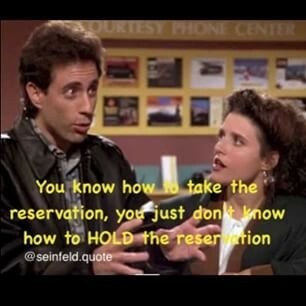 Taking the reservation is easy, but holding it is what the customer really cares about, especially since that’s closer to the end of their journey where the “moment of truth” truly lies. This is the strategic approach to driving CX, and is precisely what will drive buy-in for executives with AI. They pay attention to things like abandoned shopping carts for e-commerce, and will be very interested in any solution – AI included – that will help get customers “to the finish line” as Gord explained. Intention to buy as implied by adding items to the shopping cart is nice, but the customer journey is not complete until they get that cart to the checkout, make payment and leave the store. CX is the sum total of all these steps along the way, and there’s a great opportunity here for AI. IT may know what that opportunity looks like, but if they express it as a technology solution, it will remain tactical and only get so far with executive management. This is what “going deeper” is about – positioning AI strategically in ways that management understands. We all need to be careful given the constant state of hype around AI, and management can easily get amped with unrealistic expectations. Not only will this strategic approach increase the chances of getting executive buy-in for AI, but if handled right, it’s also an opportunity for IT to own it and carve out a new, strategic role for themselves in the organization. Seinfeld may have been a show about “nothing”, but in this case, Jerry clearly knows what a good CX should be. When you can take root cause down to the customer’s level, the strategic value of AI starts to make more sense, and when IT can articulate that without getting tangled up in the technology, the economic decision-makers will be listening with great interest.